A native of South Korea, Klara Min has performed extensively throughout North America and Europe as well as in her home country of South Korea, in some of the world’s most important concert venues. She is a Steinway Artist and is based in Berlin and New York. "Solo piano in the right hands can be such a majestic thing. Playing with deep motivation and an understanding for the music that shows she’s ready, willing and able to go beyond, this set open the ears in so many directions at once you probably can’t keep up with it all right out of the box. Read more Lovely stuff showing off a player that will be enchanting ears for years." 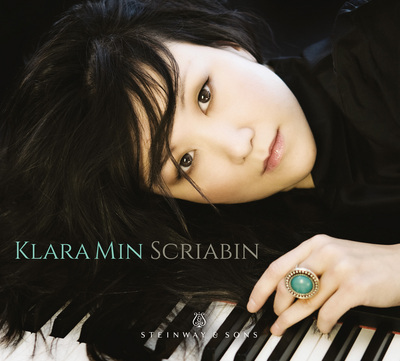 "Klara Min’s Scriabin recital is simply lovely, although that should not be taken to mean that it in any way downplays the sometimes breezy, often virtuosic demands of the music...Min shows a firm understanding of Scriabin’s aesthetic and his emotional-connection capability, using the short-form works of this recital to paint a variegated and strongly felt portrait of the many moods and attitudes brought forth both through the composer’s earlier style and through his later, more-developed one." Period: 20th Century Written: 1887-1889 Russia Date of Recording: 2015 Venue: Sono Luminus Studios, Boyce, Virginia Length: 1 Minutes 7 Secs. Period: 20th Century Written: 1895 Russia Date of Recording: 2015 Venue: Sono Luminus Studios, Boyce, Virginia Length: 8 Minutes 25 Secs. Period: 20th Century Written: 1904-1905 Russia Date of Recording: 2015 Venue: Sono Luminus Studios, Boyce, Virginia Length: 4 Minutes 13 Secs. Period: 20th Century Written: 1888-1896 Russia Date of Recording: 2015 Venue: Sono Luminus Studios, Boyce, Virginia Length: 38 Minutes 41 Secs. Period: 20th Century Written: 1907 Russia Date of Recording: 2015 Venue: Sono Luminus Studios, Boyce, Virginia Length: 3 Minutes 29 Secs. Period: 20th Century Written: 1903 Russia Date of Recording: 2015 Venue: Sono Luminus Studios, Boyce, Virginia Length: 3 Minutes 52 Secs. Period: 20th Century Written: 1887-1889 Russia Date of Recording: 2015 Venue: Sono Luminus Studios, Boyce, Virginia Length: 2 Minutes 52 Secs.